46 Piece Vintage German Hand Cut Lead Crystal Stemware Set in 6 Sizes STARBURST. Vintage German Fine Hand Cut. 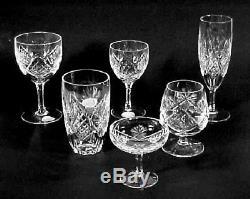 (10) 5-1/4 Wine Glasses (6 oz). (9) 4-5/8 Sherry/Aperitif/Cocktail Glasses (4 oz). 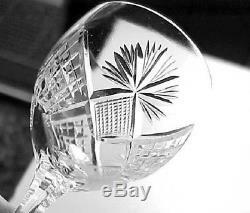 (8) Fluted Champagne Glasses (5 oz). (9) Whisky Glasses (6 oz). 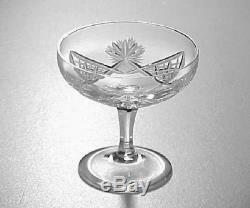 (6) Saucer Cordial Glasses (2 oz). (4) Brandy Glasses (6 oz) (Flake On 1). 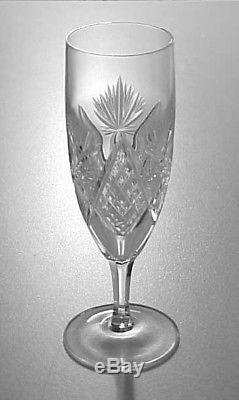 Stunning 46 piece set of vintage or antique fine hand-cut German lead crystal stemware that features a diamond and starburst fan pattern. 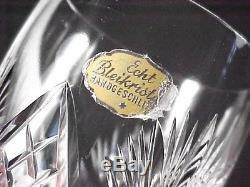 A few pieces have the original sticker that reads "Echt Bleikristall, Handgeschliffen" which translates to Hand-Cut Genuine Lead Crystal. This set includes (10) wine glasses (6 oz), (9) sherry/port wine/cocktail glasses (4 oz), (8) fluted champagne glasses (5 oz), (9) whiskey/juice glasses tumblers (6 oz), (6) saucer shaped cordial / aperitif glasses (adorable), and (4) small brandy glasses (4 oz /tiny flake on one). 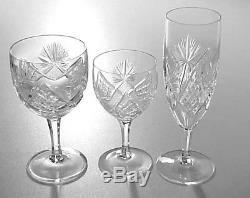 Sizes are listed below, overall these are smaller sized goblets compared to todays standard. Please see our full description below (and more photos). 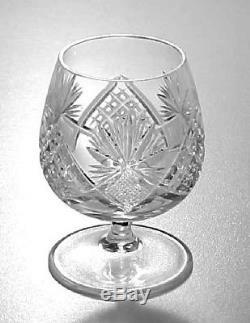 Overall excellent vintage / antique condition; one brandy glass has a tiny fleabite on the rim; otherwise no chips, cracks or lines and they display beautifully! 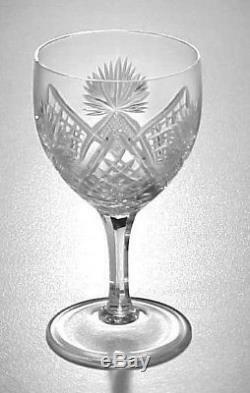 A fine addition to your antique cut crystal stemware collection! Combination of clear cut and gray-cut patterns (etched/unpolished cuts). Cut with criss-cross cuts forming diamonds filled with smaller criss-cross lines alternating with hatch cut grids; every other diamond is topped by a large starburst fan. Bases of the bowls and the foot of the tumblers are cut with scallops. Ulti-sided stem; plain round foot. Pattern is similar in style to Eurydice & Berncastel by Val St Lambert. Several pieces have old gold foil stickers Echt Bleikristal, Handgeschliffen. The glass itself is not marked/signed. 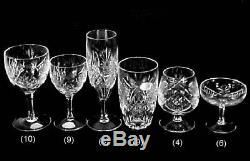 (10) Wine Glasses: 5-1/4" T x 2-7/8" D (rim); (6 oz). 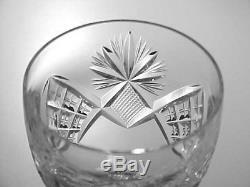 (09) Sherry/Cocktail Glasses: 4-5/8" T x 2-3/8" D (rim); (4 oz). (08) Champ Flutes: 6-1/2" T x 2" D (rim); (5 oz). (06) Cordials: 3" T x 3" D (rim); (2 oz). (09) Tumblers: 4-1/2" T x 2-1/2" D (rim); (6 oz). (04) Brandy: 4" T x 2-1/8" D (rim); (6 oz) [Fleabite on 1]. Lead glass, commonly called crystal, is a variety of glass in which lead replaces the calcium content of a typical potash glass. Lead glass contains typically 18-40% (by weight) lead(II) oxide (PbO), while modern lead crystal, historically also known as flint glass due to the original silica source, contains a minimum of 24% PbO. Lead glass is desirable owing to its decorative properties. Originally discovered by Englishman George Ravenscroft in 1674, the technique of adding lead oxide (in quantities of between 10 and 30%) improved the appearance of the glass and made it easier to melt using sea-coal as a furnace fuel. This technique also increased the "working period" making the glass easier to manipulate. The term lead crystal is, by technicality, not an accurate term to describe lead glass, as being an amorphous solid, glass lacks a crystalline structure. The use of the term lead crystal remains popular for historical and commercial reasons. It is retained from the Venetian word cristallo to describe the rock crystal imitated by Murano glassmakers. This naming convention has been maintained to the present day to describe decorative hollow-ware. 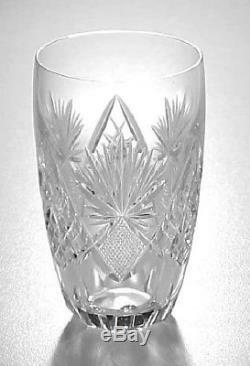 Lead crystal glassware was formerly used to store and serve drinks, but due to the health risks of lead, this has become rare. One alternative material is crystal glass, in which barium oxide, zinc oxide, or potassium oxide are employed instead of lead oxide. Lead-free crystal has a similar refractive index to lead crystal, but it is lighter and it has less dispersive power. In the European Union, labeling of "crystal" products is regulated by Council Directive 69/493/EEC, which defines four categories, depending on the chemical composition and properties of the material. Only glass products containing at least 24% of lead oxide may be referred to as "lead crystal". Products with less lead oxide, or glass products with other metal oxides used in place of lead oxide, must be labeled "crystallin" or "crystal glass". For You & Yours Antiques Gifts & Collectibles. USA only unless othewise stated. (Unless a "Flat Rate" is entered). Rates are affected by distance, size and weight. Our weights in the calculator are (very good) pre-packed estimates but may not be exact and box size can affect the rates as well. All items should be paid for together. We will let you know if we add Signature Required (a bit inconvenient but much safer than leaving packages unattended at the door). LOCAL PICK-UP: Pick-up is not available unless otherwise stated in the listing. Parcel Post can take up to 2 weeks and the Post Office doesn't consider your package "lost" until 30 days have passed. And may not be accuarate. QUALITY PACKING: We have over 15 years of experience packing fragile glass and china. Our products are washed or cleaned as appropriate and come from a smoke-free environment. We use new boxes, peanuts, bubble wrap, tissue and supplies. (Inner boxes may be other than new and/or have printing on them so if you need a "giftable" inner box please let us know). Each package will include a copy of our invoice. Some items may be restricted for sale by your country. The forward shipper will be responsible for all other claims for loss or damage. In general sales are considered to be "final" in the tradition of auctions and the sale of used goods. We strive to give excellent photos and honest descriptions, and we guarantee our items to be as described. Thank You For Shopping With. 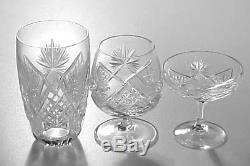 The item "46 Piece Vintage German Hand Cut Lead Crystal Stemware Set in 6 Sizes STARBURST" is in sale since Tuesday, October 2, 2018. This item is in the category "Pottery & Glass\Glass\Glassware\Cut Glass\Vintage". The seller is "4uyours" and is located in Little River, South Carolina.